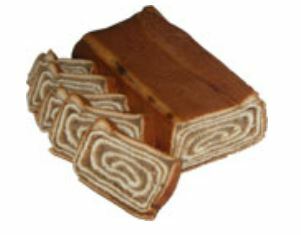 Potica is a traditional Slovenian cake, typically served on special occasions and holidays. Potica has been pleasing people and taste buds for centuries, serving as a main dessert dish in many celebrations. The dough for potica takes quite some time to prepare but after it has risen, it is typically filled with either sweet or savory fillings. Common fillings include walnut, tarragon, honey and even bacon. It is created by flattening the dough, adding the ingredients, and then wrapping the dough and shaping it into a loaf. The process gives potica delicious layers that resemble a marbled cake. Here at Italian Bakery of Virginia, our traditional potica bread is the heart of our bakery. Back in 1965, we received a traditional Slovenian family recipe for potica, and it has since become one of our most requested and best-selling cakes. We’ve added in some spices over the years to create a truly unique blended delicacy that our customers keep coming back for. We begin the process of making potica with all-natural and fresh ingredients. Baking potica each day is a time-consuming project, as it requires the careful hands of a proficient baker. The dough is carefully hand-rolled, pulled and stretched to create a traditional potica consistency. We then add in crunchy walnuts, creamy butter, brown sugar, vanilla and a variety of other spices. The potica is then baked and sliced for serving. Our most popular flavors are walnut and walnut-raisin. Both of these flavors honor the classic recipe of this bread, with a touch of sweetness. When potica first originated in Slovenia, the ingredients often told the story of the family baking it. Only wealthy families could afford expensive fillings such as nuts and cream and poorer families could typically only afford to include herbs from their garden. To honor your Slovenian heritage, or to start a new tradition in your family, celebrate life’s milestones, holidays, and good fortune with fresh potica. At the Italian Bakery of Virginia, we’ve ensured that the time-honored art of making potica has not been lost. Visit our website here.